if you are interested). I have been loving the Expert Face Brush for buffing in foundation. It's not quite as dense as my Sigma F80 which means it gives slightly less coverage, making it perfect for light daytime makeup. The smaller Setting Brush has been great for powdering smaller areas such as the under-eye or just the T-zone of the face. Good price point and I'm excited to try more of these! 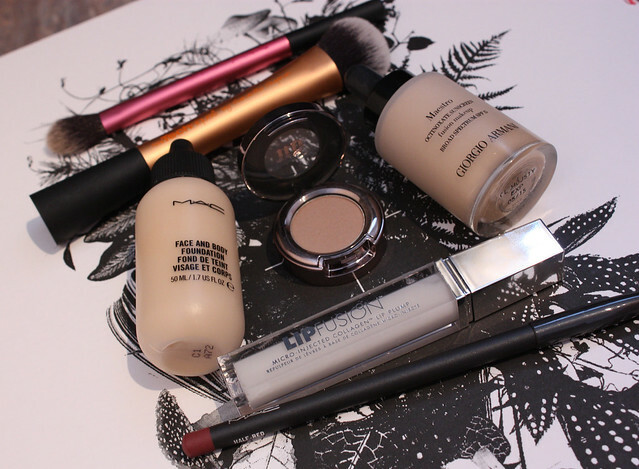 Another foundation that I purchased on the recommendation of a friend is MAC Face and Body. I got it in the shade C1 which is the perfect match for my "winter face". This foundation is super sheer. More sheer than the Armani Maestro or any other foundation/tinted moisturizer that I have tried, actually. I apply it either with my fingers or the Real Techniques Expert Face Brush and get a beautiful, natural finish. It leaves a more natural finish than the Maestro foundation and lasts a decent time on the skin. However it definitely needs to be set with powder, especially if you get oily in the T-zone. It's not an ideal formula for oily skins but I love the texture and finish so much, I don't mind busting out the blotting sheets every once in a while! Urban Decay "Naked" eyeshadow is the latest to join my collection and it's the perfect warm mid-tone brown. I've been using it all over the lid or in the crease. Great texture and easy to blend. For the lips, MAC lip liner in "Half Red" is perfect for a natural-toned defined lip. It enhances the lip line beautifully and even looks good worn all over the lip topped with clear gloss. And speaking of clear gloss, Lip Fusion's collagen-boosting clear gloss formula makes my lips feel plumper than ever. All in all, I am super happy and excited with my recent acquisitions. For now I am just anxiously awaiting warmer weather and days that don't involve me scraping ice off of my car fpr half an hour before trying to go somewhere. My beauty wishlist is growing each day so I thought I would round up the things that are currently in my radar and we can discuss them in more detail - I am especially keen on hearing your thoughts and opinions on any of the products on this list if you've tried them!